Sloppy typing has a huge impact on your speed, making you far less productive than you could be with good practice. It is easy to fall into bad habits over time without even being aware you are doing so. Following the computer keyboarding tips below will help you improve your skills to help you use your computer with ease. While two-finger typing can be adequate for those who are not spending a lot of time at the computer, touch typing with all 10 fingers will increase your speed to levels you could never reach by omitting the other eight fingers. If your hands are not in the correct position, you will never learn to touch type properly and other computer keyboarding tips are redundant. 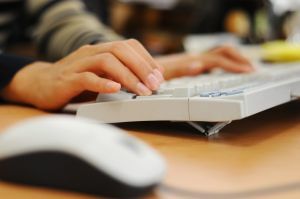 A number of online typing tutorials can help you learn ten-finger typing. Place the fingers of your left hand over the keys “A” to “F” while your right hand covers “J” to “;”. Your hands move only very slightly to enable your fingers to reach the nearest keys. Your right thumb is responsible for the space bar. After you have learned the correct movement, you will be able to type without ever looking at your hands. The combination keys were created to save you time and make commands simpler to execute. For example, the “Shift” key when used in conjunction with letter keys provides the vital function of creating capital letters. When used along with the “Function” or “Ctrl” key, you are able to command you computer to execute yet more functions. Take a few minutes to learn some shortcuts you may not have been aware of previously, but only learn the ones you’re bound to use frequently; otherwise you’ll spend time looking up rarely used functions again and again. Do you know of any additional typing tips? If so, share them in the comments section below.